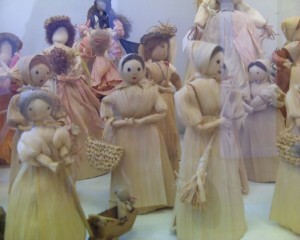 Like the dolls there are so many facets of who a mom really is. Am I just a mom or do I have a purpose that encompasses mom and so much more that you have planned for me to do for you? It is definitely important that we lead our children in the right direction; often the parent’s directions are the cornerstone of a child’s understanding of reality. What parent wants their child to suffer or be poor? We want our children to have good lives and to contribute to society. So at a young age we start to prep them by asking questions and we help them to discern what we as parents believe they would be good at doing as a career. Some parents, I feel sure, have a plan that has nothing to do with that child they just want to have a doctor for a son or a daughter. However, I think the normal middle class parent wants their children to be happy with the choice they make for a career after all here in America our children will spend far more time at work on their career than they will with their families. America’s workforce is tireless. The more hours you put in the more respect and money you receive for it. If you think about it that way then one’s career does define the person’s life. That is where most spend almost all their waking hours. Maybe if we as parents changed just a little of our guidance for our children it would help to cultivate a new mindset that could change our society one person at a time. What if we asked our children instead “What talents do you think God gave you and how would you like to share them with the world to make it a better place?” Suddenly you take away the taught need for greed and give them a need to make the world a better place. Instead of saying what do you want you say what can you Share. Instead of it being just something they choose for no real reason it is a calling that God has graced them with. Maybe that is the essential way to give purpose to a life so that when they get to be our age they are not searching, scrambling and wondering, “What on earth is my purpose?” Maybe at a young age they will decide that giving is what will feed their souls instead of accumulating life’s material goods. Maybe they will live a more meaningful life than us. What do you want for your child? Do you want them to be exactly where you are today? That is a hard question. Every one of you reading this will answer it differently. Some of us cannot answer it until we know what we want and why we want it. I want for my children to be filled with gratitude for the life God has breathed into their growing bodies and to respect it. I want for my children to give all that they are to others through whatever talents God has graced them with. I do not want my children to be rich by our society’s standards of wealth and material possessions. I want their needs to be meet and that they are comfortable with their surroundings but not immersed in things. I want my children to have a strong and clear faith in God, for Him to be their friend that they can always talk to each day and rely on. I want them to love others with mercy, compassion and respect for all people. I want them to be the Body of Christ; for their hands to do His work for others to see Christ in their eyes through their actions and thoughtful ways. The success of my children has nothing to do with the success of our secular world. Yes, I want them to go to college, get a degree, to support and be able to raise a family and have a good paying job that will provide. I want faith, charity and love to be the center of it all. Am I asking too much of their future? I don’t think so! Will they turn out that way? If the way you raise your children and the example you set and the surroundings they are in effect the outcome they have a great shot at it. I tell my children my hopes and dreams for them. I pray out loud to God like I am talking to a friend with them. At parent teacher conferences I tell the teacher I am happy that their grades are good and then I tell that teacher looking straight in their eyes that what matters most to me is that my child is good to others and seems to be following Christ’s example by being kind, thoughtful and helpful to others. Every time I do it I think it shocks the teacher but that is what matters most to me. Each time it enters my child’s mind that it is important because I state this in front of an authority figure outside our private home. Because to me it’s not private. Who they are is formed everywhere they go and by everyone they know. I want my children exposed to different walks of life so they can have compassion and respect no matter the social status, homeless, hungry, elderly, disabled, the sick. Jesus taught us to love our neighbor everyone of them like we love ourselves and I take that responsibility very seriously to teach it to my children. I am so far from perfect it’s not even funny. I have so many flaws and my children know them better than anyone else. I yell too much. I lose my patience and I get mad. My children know that I am there no matter what and they know I would lay my life down for them. They know what I am teaching them is the truth and they trust that I would never guide them in the wrong direction. Each child knows these things about their parents. It is the parent’s responsibility in life to decide on how they will lead that child. So much of what we do, what we say, how we say it and what we don’t say or do influences that child for a lifetime. Therefore, we need to reflect long and hard on what we want to teach our children. Then we need to make sure that our actions reflect our words and beliefs. Wow Lori, this is good reading. I will be sure to visit you more often. Thank you!